When I see the fortress like walls, the white painted wooden door and hear the sound of barking from within I have second thoughts about raising the brass knocker. What had I got myself into? Should I retreat before it’s too late? But it is already too late. Someone turns the door knob. By we she means family, and the meaning of her words become clear to me as Vivienne Boralessa pats the cushion beside her on the sofa in her drawing room, inviting me to sit next to her and asks me about my journey here, about my family, about my career and makes sure I have a cup of tea in my hands, prepared in exactly the way I like to drink it, before she allows me to interview her. The only child of G F de Silva and D L Sahabandu Vivienne Boralessa fondly recalls the encouragement her parents gave her when she embarked on her career as a singer. Her father, a surveyor of the Chamber of Commerce, a General Manager of the De Zoysa Company and the Managing Director of the well known Safety Tours Bus Company was not only a connoisseur of art but a playwright and producer as well. The first time little Vivienne stood before an audience was when she sang the welcome songs of her fathers two plays; Dreadful state of Lanka, and Election Echo. Her uncle, G.R Edward, who was in the audience was so enraptured by her voice he had sought her fathers permission to take her to Radio Ceylon to sing duets with him. This was in 1938. In 1940 she had taken part in an audition where the judges were Gunapala Malalasekera, Kapukotuwa and B S Wijeratne and was selected as the best singer. With her hair tied in two pony-tails, dressed for the first time in her life, in a sari, she says she was only ten years old when her talents were thus appreciated. From then on she had performed on her own, was promoted to the rank of an A grade artist in 1940 and received a payment of Rs 90 for a thirty minute program. One day as fate would have it, at the wedding of her uncle with whom she had first sung duets at Radio Ceylon she bumped into a young man who declared himself as one of her ardent fans. In 1953 he would become her life partner in a grand wedding ceremony held at the Galle Face Hotel. He is C De S Boralessa who still staunchly remains her greatest and perhaps oldest fan. With her mind still reveling in the past, she recalls how her parents had accompanied her whenever she had to go for a recording at Radio Ceylon. If her father could not make it due to some other appointment the program was cancelled and rescheduled for another day. “Those days we had to find our own orchestra and my father made sure I had the best orchestra. He was lavish when it came to spending money and gave me a Hilman Hunter as dowry on the day of my wedding.” Her father had owned a Humber Hawk while her mother used an Austin. When my eyes move skywards in amazement she assures me back in the 1950s vehicles were not that expensive. What was rare though, was for a lady to be seated at the wheel. 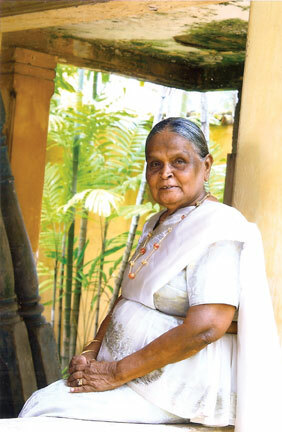 She remembers driving her Hilman from Matara to Colombo all on her own. Those were indeed the good old days. Today I don’t even own a Maruti,” she sighs. She recalls Gabrielle Gunaratne seeking permission from her father to record her songs onto HMV tapes in 1950, and later Sunil Santha making his way to her home to ask her father if he could sing a duet with her. The song was Ralla Naginne with the chorus comprising Maestro Amaradeva, C T Fernando, Kanthi Wakwalla and Percy Wijewardena. Of her six children her youngest son Kapila continues to sing with her and gives voice to Dura Pena Thanithala in her CD which was released last year. “I have entrusted the copyrights of my songs to Kapila and Indrani” she says in a voice overcome with grief. She finds it hard to believe that new comers to the field of music should belittle the hard work and dedication she weaves into her songs through her mesmerizing voice and gentle, loving nature. Old but new. Strange but familiar. As you listen to Dura Pena Thanithala, Nangi Nangi Rupika,Nawathinna Tissa, Singha kodiya... you find yourself asking how these songs played in the 1950s could still have such an appeal. The answer perhaps, is simple. It is because Vivienne Boralessa sings them that way. As I close my notebook, and bid farewell, through the back door, I realize why the front door is hardly ever opened. Everyone who spends even a second in the company of Vivienne Boralessa immediately becomes family, and all family members use the back door.